Even though we’ve entered a new year, I still find myself humming Christmas hymns. One chorus in particular has stuck in my mind: “Go, tell it on the mountain, over the hills and everywhere. Go, tell it on the mountain that Jesus Christ is born!” The message of the song is simple, but in its simplicity is a strong call to action for the church. It is a call that challenges us to tell everyone about the transformative impact that Jesus Christ has in their lives and in our world. We are challenged to share the good news with all who will hear it, even shouting it from the mountaintops. In Paul’s second letter to the church in Corinth, he calls them to the work of serving as ambassadors of Christ. Prior to verse 20 in chapter 5, Paul mentions that our love for Christ should compel us to no longer see anyone from a “worldly point of view” but, instead, to see each person as a new creation in Christ. “The old has gone, the new is here!” (2nd Corinthians 2:17, NIV). And as “new creations,” we inherently become ambassadors of Christ. We are now called by Jesus to be his messengers. In the Old Testament, being an ambassador for the king was a significant responsibility and honor. When ambassadors entered another country, they were treated just as if they were royalty themselves, and not just simply representatives. Being ambassadors today may not be exactly the same, but they still have the responsibility of sharing a message of the one whom they represent. While we may not be thrilled at the idea of being compared to government officials, it is important for us to remember that we represent Jesus and the kingdom of God in a very similar way. I believe we are on earth at the right time for the right purpose to fulfill God’s greater plan for all people. We are here right now to fulfill God’s will, to speak as “new creations” in Jesus, and to welcome the new creation ordained by God’s kingdom. Some of us are called to be ambassadors within the communities where we live, work, serve, and worship. Others are ambassadors at the district level, where the message of God can be extended further through the ministries supported by congregations. Through denominational ministries, staff work diligently on behalf of the larger church to be Christ’s ambassadors, where the message reaches across the United States and out into the world. 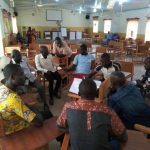 Through Brethren Volunteer Service and the Office of Global Mission and Service, some are called as missionaries who accompany brothers and sisters to nurture budding churches in places like South Sudan, Democratic Republic of Congo, Rwanda, and Venezuela. Others witness to God’s message of peace and justice by speaking with local and national representatives with support from the Office of Peacebuilding and Policy. Some hear the call to grow in discipleship or to revitalize and strengthen local ministries, and respond by attending events hosted by Discipleship Ministries. While these examples only scratch the surface of the work coordinated by Church of the Brethren staff, they reveal the importance of serving as Christ’s ambassadors. Each of us, in our “new form,” have been blessed with gifts and talents that allow us to uniquely represent God where we are. Whether you volunteer your time and talent, pray for our ministries without ceasing, or support the work of the church through financial gifts, you are serving as an ambassador of Christ. Come, let us “Go, tell it on the mountain, over the hills and everywhere” that Jesus Christ is making all things new. 19 food distributions were organized for over 2500 families. 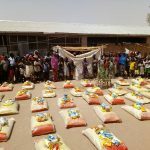 One woman who received food had been captured by Boko Haram in 2015 and was freed with help from the Nigerian Army in November 2018. She was so appreciative of the food and household items because once freed they had nothing. 6300 people received medical help and screening for Hepatitis B. 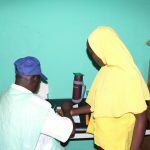 The medical officer and assistants travel thousands of miles to hold mobile clinics for the Internally Displaced Persons (IDP’s) and this year they embarked on a screening and inoculation program for Hepatitis B. 169 homes were rebuilt costing about $1000 a home. 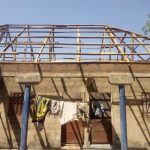 This program is in high demand for all those whose houses were burned by Boko Haram. Only the most needy (about 20 per town) receive the assistance and the recipients must complete the walls before the Disaster Team provides the roofing. Trauma workshops and counselling have been provided for around 500 people. This trauma awareness includes being able to tell their stories and is going a long way to help overcome the extreme trauma they have incurred. Forgiveness is emphasized and many who participate in a workshop go home and tell others so the healing is spreading. The level of education in NE Nigeria has deteriorated over the past few years. Some schools were closed, some burned to the ground, and others used to house IDP’s. 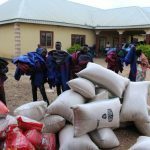 The Nigeria Crisis Response sponsors a boarding school, several learning centers and has provided school fees for more than 1000 children. Children of the IDP’s and many others still have not been able to go to school and more assistance is needed. Most people in the NE survive by farming. 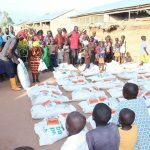 The Response helped 2500 families with seeds and fertilizer. This year the distribution was streamlined through the Districts. The District Leader from Mubi said the hardest thing is choosing who will receive the help when so many are in need. With 17 of his district’s 25 churches destroyed, the needs are overwhelming. A Soybean Value Chain project is also being sponsored with help from Global Food Initiative and Illinois Soybean Innovation Lab. Good water sources are always in demand. The IDP camps all need to provide and maintain a water source. Some wells were destroyed by Boko Haram and other places have never had clean water. The Response provided 11 communities with wells/bore holes, helping thousands of Christian and Muslim households. Widows and orphans must find ways to support themselves and their families. 5 skill training centers operated in 2018 graduating 269 students. Each student receives the tools necessary to start a business. In addition, 135 widows were give around $100 as start-up capital. 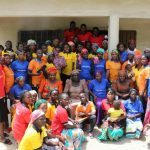 Through the EYN Women’s Ministry, workshops have been held, literacy programs put in place and peace groups started. The influence of the women is growing throughout the society. Numerous other activities were held during the year. Seminars were held for capacity building, the District Leaders received training in Disaster Preparedness, Yola IDP camp was fenced, Shaffa Theological Education by Extension office was repaired, a new vehicle was purchased, special relief efforts were organized for victims of the Fulani herdsmen attacks, 2 Tripartite meetings were held, a Muslim & Christian Peace conference was organized, joint church re-building workcamp were held in Michika, and much more. WHAT A YEAR! Please continue to pray for Nigeria. Do you have a favorite blanket? Mine is a purple, gray, black, and white afghan that my wife made for me years ago, right after we started dating. I was on a mission trip at the time, and it was carefully crocheted with the hope of my safe return, and with love. As experienced during Advent, Mary’s song is a beautiful stitch in the larger, intricate blanket of God’s story. God’s promise to bless her and to save Israel filled her with joy, and she sang a new yet familiar song, testifying to what God had done and would do. The song of Mary echoes the sentiments of an earlier song. “Give thanks to the LORD….Sing praises to the LORD, [who] has done gloriously; let this be known in all the earth. Shout aloud and sing for joy… for great in your midst is the Holy One of Israel” (Isaiah 12:4-6). Mary and Isaiah both offered praise to God for past faithfulness, current presence, and future promise. Their eyes could not behold the fulfillment of God’s promises, but through faith, their hearts perceived God’s work as already complete. Their words are great for us to read (and sing) now because of all that God has done, is doing, and will still do in our midst. As we reflect on this past year, God has surely done great things among us. Youth and advisors gathered at National Youth Conference to be challenged in their walk of faith. Church planters and others gathered at the New and Renew Conference for professional development and encouragement for the work of nurturing new disciples. Josiah and Christine Ludwick and their children began a year of service in Rwanda to preach, teach, and demonstrate a Brethren way of living. Brethren in Spain continued to add new congregations and expanded their membership. 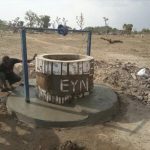 In Nigeria, Global Mission executive Jay Wittmeyer was present at the commissioning of a new EYN congregation at the Gurku Interfaith Camp for displaced people. These are just a few examples of how your gifts helped add to our larger community blanket in 2018. 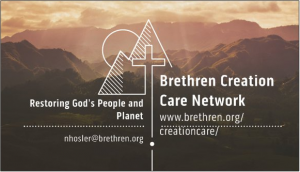 As you reach for your favorite blanket this winter season, please sing a song of thanksgiving for all that God has done through the Church of the Brethren, offer a prayer for the continued work of our ministries, and make a gift with hopeful expectation of what God will do. God surely has great things in store for us, and with God’s help and through your partnership, 2019 will be wonderfully stitched with hope and love.